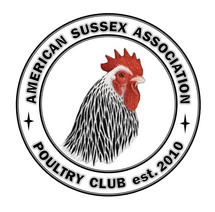 In the Summer of 2014, the American Sussex Association voted into effect an Exhibition Point System to encourage exhibition of the Sussex chicken and recognize Sussex Exhibitors of Merit. The following Exhibition Point System was developed by Christina Haner with the assistance of the ASA Officers and Board Members, we thank her for her time dedication to the cause. Points shall accumulate as long as the exhibitor is a member is in good standing with the American Sussex Association. awarded points are cumulative, meaning ASA members may attain all three award levels without having to start over after reaching an award level. Should a member lapse or otherwise terminate their membership, exhibitor points accumulated will reset to zero. Only members exhibiting at shows officially sanctioned by the American Poultry Association and/or the American Bantam Association will qualify for exhibitor points. It is highly recommended that ASA members also keep membership with the American Poultry Association, in order to qualify for more exhibitor awards through the APA. A Show Report Form must be completed and signed by the show secretary, and submitted to the ASA Show Coordinator no later than 90 days after the show date in order for points to be counted. For ASA Club Meets, the Show Report form will be sent to those requesting the meet. For NON ASA MEETS it is the responsibility of the exhibitor to bring the show report form (available here) to any shows they attend and ensure the form is given to the Show Secretary for completion. Only one show report form is needed for each show, so if multiple ASA exhibitors are at one show only one member needs to bring the show report form. ASA meets can be requested by submitting a meet request form (Click here to download meet request form) to the ASA show coordinator at least 30 days in advance of the show. (Click here to request a Meet online) When requesting a Meet, please give us as much advance notice as possible, as we will be advertising all approved Meets on the ASA website and Facebook pages. You will be notified via email by the show coordinator if your meet is approved or denied. Meets may be requested by individuals or on behalf of a show. If an individual (Independent of a show club) is requesting an ASA Meet, it is highly recommended the individual contacts the Secretary for the show prior to the event to make them aware an ASA meet has been requested. This is a courtesy as the Show Secretary will be responsible for completing and returning the Show Report Form at the conclusion of the event. The show report form will be sent to the Individual/club requesting the meet, it is their responsibility to ensure the form is given to the Show Secretary at the event. Show Report Forms are also available on the downloads page. ASA members showing at meets will receive 5 additional points for Special meets, 10 for state, and 20 at national meets- points are given per member, per meet attended. In addition, special awards will be given to the BB/RB of Special and State Meets, and special awards will be given to BV/RV and BB/RB at the ASA National. Points will be earned for exhibiting Bantam and Large Fowl Sussex in APA Recognized Varieties (Light, Red and Speckled) as well as ASA Approved Varieties of Large Fowl (Coronation, Buff, and Silver). Please make note that ASA Approved Varieties will not be allowed to place any higher than Best or Reserve of Variety at an APA or ABA show, per APA rules. Points will be calculated based on level of achievement and number of birds judged. The maximum amount of points any one bird can earn will be the maximum amount of points at the highest level won. Class winners will receive one point for each bird shown, and one point for each bird your bird places over up to the maximum in the highest class it places in. No points will be awarded to any placement below Reserve of Variety. Less than Reserve of Variety- No points. BV will receive points for every bird in the class; so if you have BV in a class of three, you will receive 3 points. RV would receive one less point than BV. BB and RB receive points based on all varieties shown. If there were 12 total Sussex in the show: 3 Buff, 3 Coronation, and 6 Light Sussex, and a pair of Light Sussex won BB and RB, the BB light will receive 12 points, and RB light would get 11 points. For the rest of the Sussex, the BV Buff would receive 3 pts, RV Buff would get 2 points. BV Coronation receives 3 points, and RV Coronation would receive 2 points. If you have the only Sussex there, you will get one point for breed/variety wins. If the BB Light goes on to win the English Class as well, it will also get points for the other birds in the English Class, to the maximum, and so on up the chain as high as it places. If a Sussex won the English class (max of 50), and the class had a total of 40 birds, the Best English would score 40 points. If there were 65 birds shown, the Best English would only get 50 points. If you have any questions, please contact our Show Coordinator Holly McDonnell. A Certificate of Achievement is awarded to a member of the American Sussex Association, whom earns 100 points exhibiting Sussex fowl of any variety and has been a member of the Association for at least one year. A Master Exhibitor Award is given to a member of the American Sussex Association, whom earns 250 points exhibiting Sussex Fowl of any variety and has been a member of the Association for at least two years. A Grand Master Exhibitor Award is given to a member of the American Sussex Association, whom earns 500 points exhibiting Sussex Fowl in any one variety or 1000 points in any variety and has been a member of the Association for at least three years.